For over 100 years, Des Moines Public Schools have been educating the students of Iowa’s capital city. Today, the district is the largest provider of public education in Iowa, with more than 30,000 students and nearly 5,000 teachers and staff at work in more than 60 schools throughout the community. The wide range of opportunities in Des Moines meets the academic interests, abilities and goals of every student. The Des Moines Public School District had come to a fork in the road regarding its printing equipment. With over 1,200 aging printers scattered throughout the district, the district wanted to get a better handle on what equipment needed to be updated and if more cost-effective printing processes were available. Marco was initially brought on board to update the district’s central print shop. For years, the print shop averaged only two million impressions a year, while the Risographs throughout the district—which were more costly to maintain—were averaging 18 million copies a year. Once the print shop was updated, the district sent out an RFP for managed print. Warren says Marco won the bid; in part, because the company’s service went above and beyond other providers. “We had the same vendor for years and the service was just status quo. It was clear that Marco was serious about offering great service. They really take service to heart,” he recalled. One reason the district wanted to move to managed print was to get a clearer picture of what it was spending. To get the process started, Marco completed an assessment of all 70+ buildings in the district. The assessment enabled the district to cut its printer fleet by 75 percent. To get a clearer picture of printing costs, the district implemented a software that tracked print usage. The reports created by the software opened their eyes. “That really started the conversation about how much money we were spending annually and what we could do more efficiently. It put it in perspective when you realize you could take some of that money and put it toward more teachers in the classroom,” said Warren. Getting the school staff to make the switch from printing in the classroom or just down the hall to sending everything through the print shop wasn’t an easy transition. In fact, Warren says it was the most difficult project he’s managed in the seven years he’s been in this position. “It was a huge culture change, but Marco’s experience really helped. They provided the training, fielded questions and walked the staff through the long range of why the new process was better. It took a lot of conversations to make it happen and Marco was there,” added Warren. In just the first year, the print shop went from doing two million impressions to 22 million. To keep up with the demand during the first month of the school year, the print shop stayed open 24 hours a day/seven days a week with the help of Marco support. With the new process in place, the district is now saving 12-16 percent a month on printing costs. More importantly, it’s able to see where its dollars are being spent. “The reporting is really where it needs to be. People trust the reports and they’re accurate. The billing part is huge because it’s a lot more streamlined than it’s ever been,” he added. Besides being cost effective, Warren says Managed Print has freed up his staff to spend time on more important initiatives. And, as far as service, Warren says Marco continues to live up to its word. “Marco goes above and beyond to help us. They created little cheat sheets for the staff to let them know who and when to call. 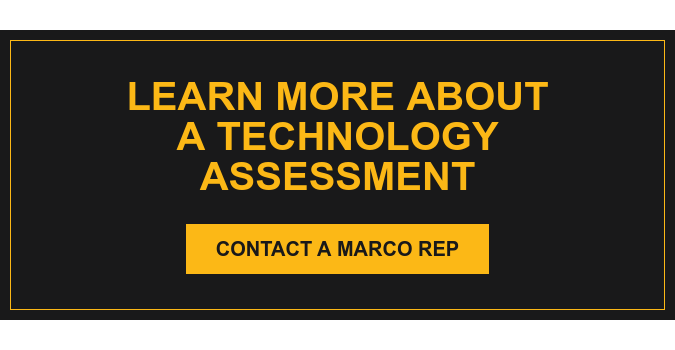 Basically if anything goes wrong with the printers, we call Marco. The service is also more streamlined. We now have auto-replenishment on the toner. With the service and the maintenance, Marco is there before our office managers even know something is wrong. They replenish the toner before we even know it needs to be changed. So that’s really helped and has saved us time,” he explained. More than anything, Warren says he feels he has a true partner. “I don’t look at Marco as a vendor. It’s not them versus us or us versus them. We are in this together. They’ve been there and they’ve been by our side the whole way,” he added.